Enjoy the luxurious look of a grand piano cabinet with a polished ebony finish, as well as grand piano touch and sound. The touch of the Clavinova keyboard has been praised by pianists for a performance feel that makes you forget it's a digital piano. The secret behind this superior touch is the same hammering system and spring-less mechanism as a grand piano. Depending on the weight of the hammer, the force of your touch and the natural key return when you release it, the Clavinova faithfully reproduces the keyboard touch of an acoustic piano from the heavy feel in the lower range to the light feel in the higher range. Also important is Yamaha's unique three-sensor system, which accurately senses and interprets the behavior of the keyboard, just like a grand piano. When playing continuously or with a light trill, techniques used in many pieces such as Für Elise, you can play with a bright, vivid feel. [Recording on a Clavinova is simple and speedy]. Recording is a useful way to evaluate your performances. You can record with the touch of a button and even do two-track recording, which lets you record the parts for your two hands separately, then play them simultaneously. You can also store performances on a USB memory device. * * Storage format is SMF. To play the files on a computer, compatible software (such as QuickTime or Windows Media Player) and sound source are required. [Record performances onto USB flash memory so that you can share] your music. By using the USB Audio Recorder, you can record your own performances on to USB flash memory as an audio file. * Because it can be played back without a Clavinova, you can store it on a PC to track and compare your progress or put the recordings on a CD so your family and friends can enjoy them. You can also listen to the files on-the-go by loading them on to portable media players. * Uses WAV storage format. 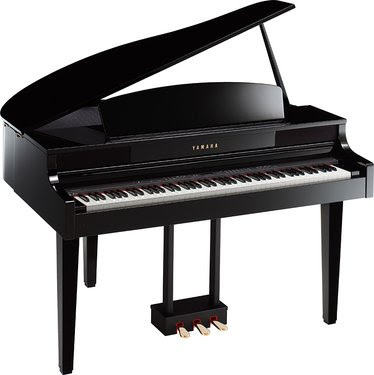 Along with the piano voices, Clavinova also offers a wide selection of musical instrument voices, including electric piano as Yamaha's CP1, harpsichord, guitar and strings, which you will find many opportunities to use. Dual, which means playing two voices simultaneously, provides a rich sound by overlapping the piano sound with strings. By combining the voices in various ways, you can enjoy many different styles of play. The elegant look of a grand piano cabinet. This compact model has the shape of a grand piano with its large top. The impressive body line projects a look of elegance, adding visual enjoyment to your playing. The design embodies the true essence of a piano, with careful attention paid to every detail. A deep and brilliant luster, achieved by using the same coating and techniques as for grand pianos. 128-voice polyphony, 14 instrument sounds, Intelligent Acoustic Control (IAC), USB audio recorder, Reveal Key panel Cover, dimensions W x H x D: 1429 x 930 x 1146 mm, weight: 98 Kg, color: Black high gloss.